✓ Wii Menu: Click the Wii icon at the upper left of the screen to return to the Wii Menu screen. You can also return to the Wii Menu screen any time by clicking the Home button on your Wii Remote. ✓ New Profile: Click the happy-face, plus-sign icon at the middle left of the screen to create a new user profile. This new user has to go through the setup process we describe earlier in this chapter. After registration, the new Mii appears in the Wii Fit Plaza, ready to be selected. ✓ Pet Stats: Click the animal icon in the lower left of the screen to register User Data for your pet. You enter your pet's name, pet type (dog or cat), and characteristics. Although your pet will not be able to participate in the activities, your pet's weight can be measured and tracked. In addition, your pet's avatar appears during some of the activities to keep you company. Keep in mind that you can register only up to eight personal profiles, and this number includes your pets. 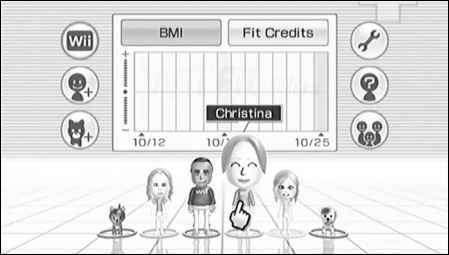 The Wii Fit Plaza, showing a highlighted Mii. Creating a profile for someone 3 years old or younger has the same restrictions as registering a pet. Once the baby is older than 3, all measurements and activities will become available. Keep in mind that whether you're holding a baby or pet, the Balance Board's 330-pound maximum weight limit still applies. • Install Channel: This option installs the Wii Fit Plus Channel on your Wii Menu, which allows you to check your weight, BMI, and overall Wii Fit Plus stats without having to insert the Wii Fit Plus disc into your system. 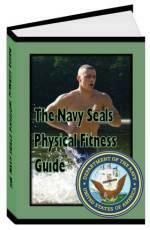 This Channel is described in greater detail toward the end of this chapter. • Wii Balance Board Check: You can use this option to verify if the four sensors on your Balance Board are functioning. If every sensor has a check mark, your Balance Board is working as it should. If not, visit www.support.nintendo.com or call Nintendo's hotline at 1-800-255-3700 for assistance. • Credits: Select the Wii Fit or Wii Fit Plus icon in the lower-right corner of the screen to see who helped make these titles possible. Pressing the B button at any time on your Wii Remote brings you back to the Settings menu. ✓ Trial: Clicking the question mark icon at the middle right of the screen starts up a trial version of Wii Fit Plus, which bypasses the standard Mii setup and registration procedure. After selecting one of six generic Miis, you can perform a basic Body Test or choose from a selection of 15 training games. 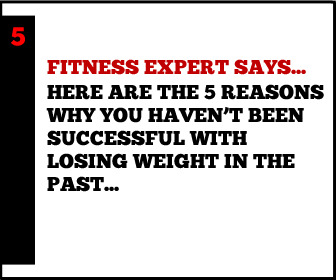 Because this is just a trial, weight and training data are not saved, so this is most useful for giving your friends and family a quick demonstration of what Wii Fit Plus is all about. ✓ Multiplayer: Click the multiplayer icon in the lower right of the screen to access this mode, which allows you to use one or more of the Miis stored on your Wii console to participate in the nine multiplayer activities. Each player takes turns playing a single round and using the Wii Remote and Balance Board. Stats tracked in this mode are kept separate from those in the main Wii Fit Plus game. ✓ Graph: This large area centered in the top half of your screen displays the daily BMI measurements for all the Miis currently registered on your system unless their profiles are password protected. Select the Fit Credits button to change to the daily bar graph view of how much time you've been spending with Wii Fit Plus each day. You can isolate the data on a single Mii by hovering your Wii Remote over that player. You can also click anywhere on the graph and drag the Wii Remote pointer right or left to see earlier or later dates, respectively. ✓ Miis: Click on a Mii and then select Begin to Advance to the Calendar screen, which is discussed in the next section.